I was talking last month with one of my newer clients, discussing arrangements for a teleseminar he was preparing. He uses one application to manage the registrations, another to facilitate the delivery of his program, and an email marketing program to do the confirmations and his post-event follow-up. On top of that, my piece includes coordinating all of tasks and details necessary in my own project management system to make sure it all goes off without a hitch. All are separate, in their own little technology ecosystems. Sound familiar? Running a small business today is a complicated and intricate interplay of so much technology. There are hundreds – thousands – of applications out there. The problem is that they likely each provide only one piece of the puzzle. It’s a patchwork of data that has to be pieced together like an old-fashioned quilt. How can you pull them together into one cohesive system? It IS possible, though it takes some ingenuity and a little help to stitch it all together. First, you’ve got to have a framework of strong systems and processes already in place in your business. Sure, systems sound a little boring, and for some, there’s a feeling that carved-in-stone routines stifle creativity or spontaneity. On the contrary – I’d argue that having systems in place for your everyday, repetitive tasks allows for more creativity. They free up the mental space you might be filling with worries about your business: how did I do _____ last time? Did I remember to _____? Where did I file that _____? Don’t stop at developing these foundational systems and processes, either. Take it one step further and document them – write out the steps, or record a quick video for particularly extensive or complicated processes. Create templates describing the process that you can duplicate. 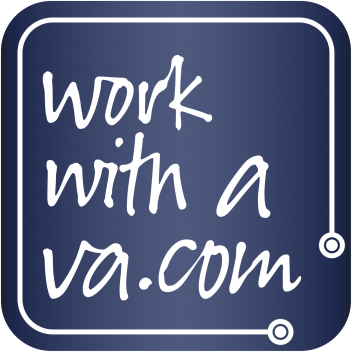 With these in place, you’ve got a roadmap that you and your VA can follow every time. 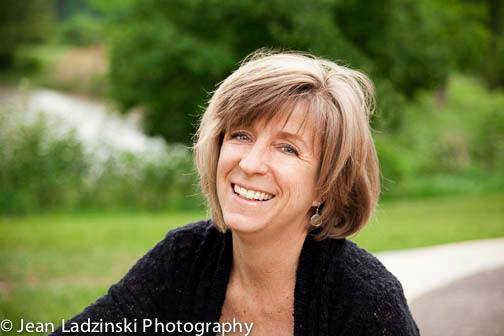 A client of mine was feeling discouraged about how to stay top-of-mind with former clients, and develop new prospects for her coaching practice. She’d been trying to publish an email newsletter twice a month, but it only went out sporadically, because she just couldn’t quite get into the routine of doing it. So many other, more urgent things got in the way, and before she knew it, she’d missed her target publishing date yet again. We invested some time together to talk through what she’d been doing, and decide what I could shift to my task list. I wrote down the entire process, and then laid out every step in a template in our shared project management system, assigning her only the pieces that truly needed her input or approval. Two or three months down the road, publishing that newsletter was a well-oiled machine. We both knew what had to happen when, and she’d freed up her time – and mental energy – in the process. Once you’ve laid out and documented how you do everything in your business, then it’s time to look for ways to optimize your operations – and that’s where automation comes in. How great would it be to have things ticking along behind the scenes, without you having to manage the individual pieces? 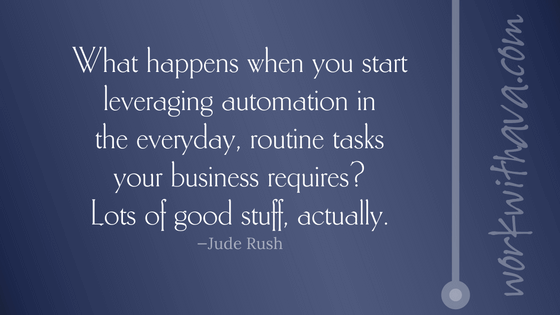 What happens when you start leveraging automation in the everyday, routine tasks your business requires? Lots of good stuff, actually. For starters, you’re going to save even more time. Seems obvious, right? Any time you can eliminate some of those repetitive things that must be done every day, you’re going to reclaim a few minutes, and those add up over days and weeks. Of course, maybe your VA has already freed up your time by taking over some of these tasks for you. Well, how about saving your VA time? Surely that benefits you – she can devote her efforts to something more mission-critical and valuable to your business. Automation may be able to extend the reach of your current systems. You may already have a favorite piece of software or application that you’ve been using for years, comfortable and intuitive, but it’s not meeting your needs as well as it used to. You find yourself thinking “if only I could do ___ with this!” You need something more powerful, something with a few more bells and whistles. What if there was a way, through automation, to extend the capabilities of your tried-and-true solution, without having to scrap it and learn something new? Interested in saving money? Automation may stretch your business dollar. Rather than jumping into that expensive, all-in-one solution, maybe you can hook together what you’ve already got. You might be able to postpone moving from the free tier of an application you’re currently using to the higher-priced paid tier by leveraging automation to accomplish the same thing. It’s astonishing how many different software programs and apps are out there – working in “the cloud” has changed forever how we manage the information assets on which our businesses rely. The list goes on and on. So many little bits and bytes of data, all in their own little containers… mind-boggling. What happens when you’ve got the same or similar info in two or three different apps? You have GOT to figure out a way to share it all, for them to speak the same language, or at least translate it into a common dialect. My client’s email provider only allowed us to send the same welcome letter to anyone who signed up for any one of her email lists, regardless of whether they wanted her newsletter, needed more information about her online courses, or were interested in signing up for her international workshops. We wanted a more specific approach in addressing our contact’s needs. I was able to connect signups on her website through an intermediary program that sent a different welcome letter based on the contact’s specific interest, and then piped their information through to her original email provider. We were able to postpone the time and expense of changing email providers and still got the functionality we needed. Didn’t cost a penny more and it all happened automagically. Later in my day, when I’ve scheduled time to review in Asana, all these new tasks are waiting there for me to take action on, and the details have been passed through into Asana, so I don’t have to go back and find the original message, email, Google sheet entry, or task in another application. I have a client who does a lot of public speaking. Our email marketing provider provides a text-to-join feature; audience members can text us and be instantaneously sent an email that gives them a link to download more information from my client about his presentation. Cool, right? There’s one small hitch, though. The application only collects the email address and mobile phone number, but not the name of the person making the request. We’d like to be a little more personal in our future interactions with these attendees, so this posed a problem. My solution was to send the new contact’s email address to another contact management application, which scours the internet to uncover as much info as it can related to that email address, and then returns to add whatever it has found to the contact’s record in the email application. When it finds a match, we now have not only the contact’s name, but possibly facts like her title, the organization she works for, and how to connect with her in any number of social media profiles. Again, this happens automagically behind the scenes, without any additional intervention from me or my client. By now, I suspect that your mind may have started ticking, imagining at least one or two aspects of your business that could benefit from adding a system, creating a process, or twisting up a way to connect your applications. Spend the time and investigate how you can simplify, streamline, and automate your daily operations. You may find it will pay big dividends in your productivity and reduce that feeling of being overwhelmed by all the details you’re managing every day. About our guest blogger Jude Rush: Jude has been hooked on technology since she got her first personal computer 30 years ago. She is the AssistU 2016 Techie VA of the Year, and a Certified Professional Virtual Assistant, who supports her clients in most every aspect of managing their businesses. When she’s not working, she’s likely to be cooking, traveling, listening to music, or obsessing over this week’s NFL football pool picks. Thanks so much, Alana. Hopefully it gave you some good ideas about how you can use these in your own business! Jude – I love your blog. So much useful and valuable information. My mind is already ticking!! Good deal, Pat! It’s fun when you start considering all the possibilities. Thanks for commenting!